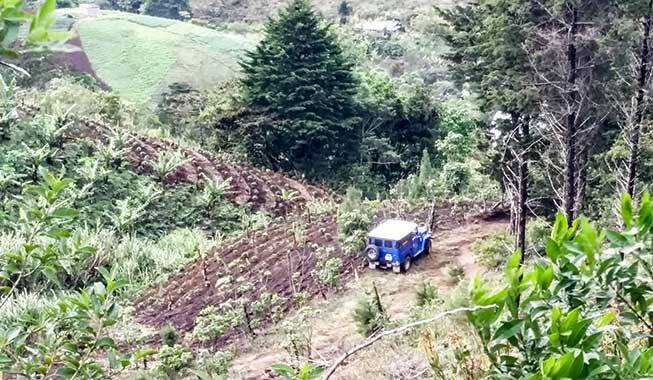 This is precisely why we only specialize in the restoration of the iconic Toyota Land Cruiser. In fact, our love for the brand shows in everything that we do and grows with every Vintage Cruiser™ frame-off restoration that we complete. It is this singular focus that inspires us to deliver the best Vintage 4x4™ Toyota Land Cruiser restorations in the world. Our goal is to redefine the Vintage 4x4™ experience. This is why every Vintage Cruiser™ that we build is hand-crafted and personalized to your exacting specifications. During this stage of production, we rely heavily on client feedback to determine the intended use of your vehicle so that we can carefully choose the most suitable body type, power and drivetrain configuration, and installed options. Our passion is to listen and learn from your ideas so that we can build the Vintage Cruiser™ of your dreams. As part of our rigorous selection criteria, every donor vehicle that we select must have a solid chassis with little to no body rust, and above all, matching numbers. This guarantees that every Vintage Cruiser™ that we build becomes an authentic and valuable Toyota Land Cruiser restoration. If it's not welded on, then it's taken off. What this simply means is that we completely disassemble each and every Land Cruiser down to its chassis as part of our thorough Vintage 4x4™ restoration process. 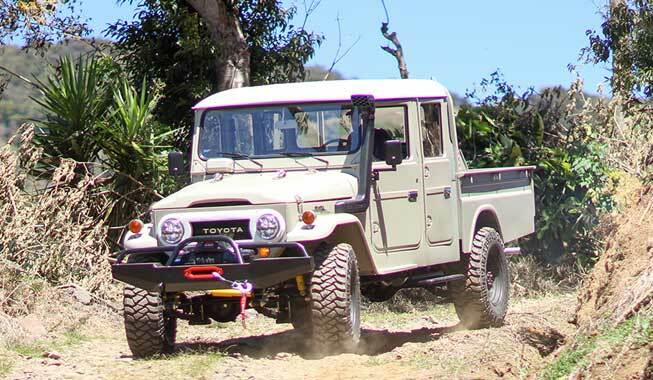 Your Land Cruiser is then restored to better than original factory specifications. 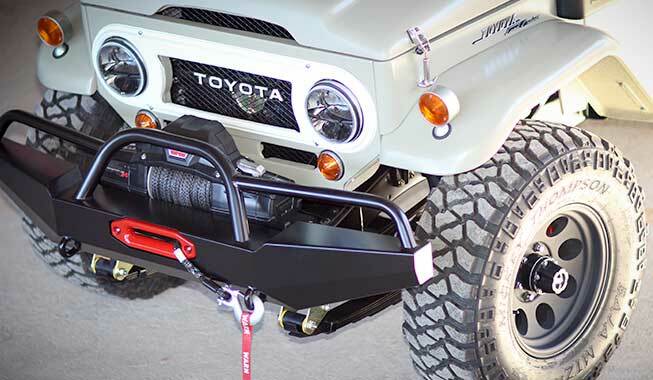 Unlike many of our competitors, we have access to our own reproduction dies and molds that allows us to reproduce virtually any Land Cruiser body panel to original Toyota specifications. In fact, nearly 70% of all the metal in your newly reborn Vintage Cruiser™ is replaced with our custom fabricated body panels. The other 30% is hand scraped before being sand blasted and brought back to bare metal. 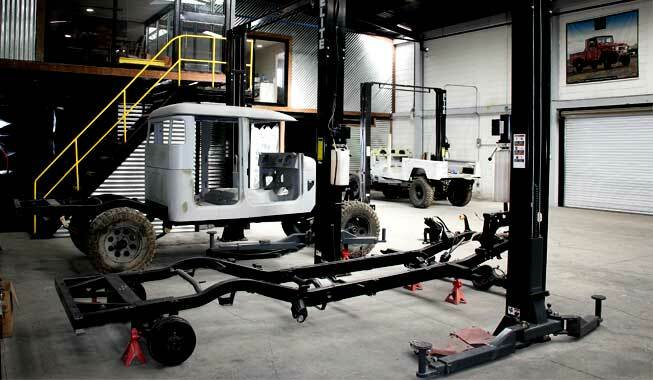 This ensures that we can guarantee a factory finish on every Vintage 4x4™ restoration that we complete. The end result is a pristine canvas that we can finish to better than original Toyota factory specifications. Our experienced prep and paint team applies a two-step etch priming process to every substrate that has been hand scraped and sand blasted to ensure the highest level of rustproofing available. Why do we use a two-step etch primer? Because original body panels are generally galvanized or electrocoated and hand scraping and sand blasting removes this protection. So, etch priming is the only way to properly re-seal the metal to prevent future corrosion. We then apply RhinoLinings© brand coating to the interior floor and exterior undercarriage of all our Vintage 4x4™ restorations to ensure the highest level of protection against corrosion, impact and abrasion. Finally, we apply five coats of Sikkens premium color and three coats of clear before we wet sand and buff your Vintage Cruiser™ to a deep brilliant gloss to better than original factory specifications using 3M polish. Every Vintage Cruiser™ that we build receives a comprehensive overhaul of every major mechanical component of the power and drivetrain. What this simply means is that we fully disassemble, inspect, machine (as necessary) and rebuild the engine including the head, crank, pistons, rods and cam shafts. The transmission is also completely dismantled and put back together again as well as the transfer case, clutch assemblies, and front and rear differentials using new bearings, seals and gaskets. Our goal is to deliver the most reliable Vintage 4x4™ restorations on the market. 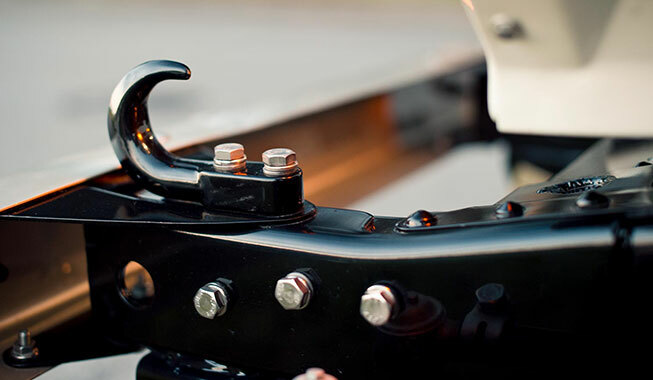 As a standard feature on every Vintage Cruiser™ that we build, we remove and dispose of all original break and hydraulic lines and replace them using new hoses, fittings and couplings. We also completely renovate the entire braking system by installing new brake boosters, pumps, pads, bearings, rotors (or drums), seals and gaskets. 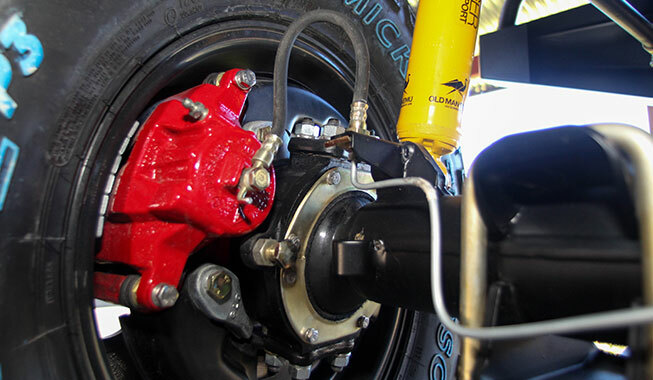 If the client has requested disk brakes and/or power steering, we make the proper modifications using only genuine Toyota parts and accessories whenever possible. Our commitment to safety is a top priority with all of our Vintage 4x4™ restorations, and that is why we fabricate and-re-engineer all braking components from scratch. We are proud authorized ARB distributors and every Vintage Cruiser™ that we build comes standard with an Old Man Emu (OME) suspension. As part of every Vintage 4x4™ restoration that we complete, we upgrade the original factory suspension using new OME front and rear leaf springs, bushings, U-bolts, greaseable shackles, pins, shocks and dampeners. 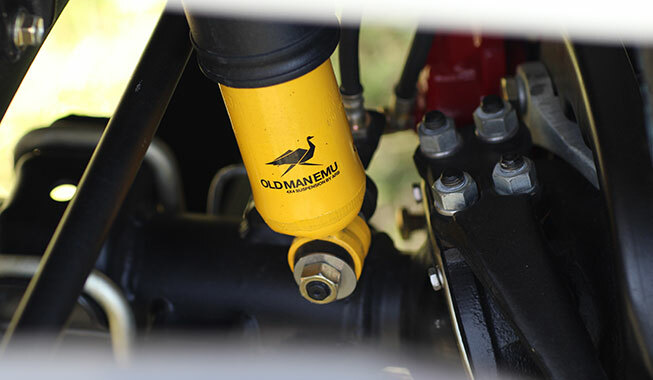 You can select from a variety of OME suspension configurations to suit any off-road adventure. 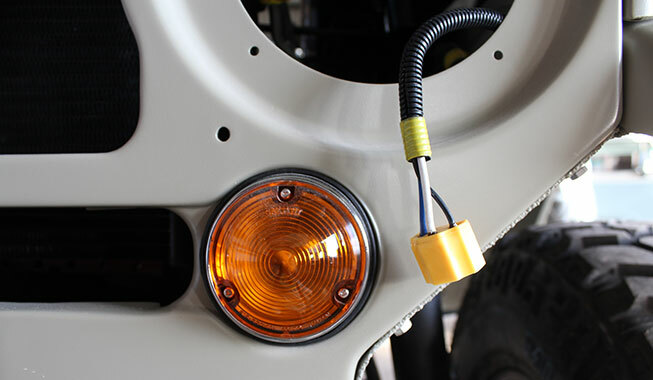 One of the most important stages of the Vintage 4x4™ restoration process is the installation of the electrical system. This is why every Vintage Cruiser™ that we build receives a brand new wiring harness (including relay boards, fuse blocks, fuse covers, connectors and ground straps). As a standard feature, we also install a new battery, starter, voltage regulator and alternator. Our electrical engineers also work closely with every client to design, develop and install the more advanced features of their unique electrical specifications, such as those for the winch, auxiliary lighting, dual battery system, solar power, on-board compressor and the entertainment system to name a few. The loom is the nerve center of every Vintage 4x4™ restoration that we complete, and that’s why every electrical component installed in your newly reborn Vintage Cruiser™ is custom made. As part of our standard interior features on all Vintage 4x4™ restorations, we replace the instrument cluster with either a new OEM analog or a Vintage Cruiser™ branded digital cluster. All labels, shift plates, dash knobs and controls are installed new, and the steering wheel and column are brought back to original Toyota specifications. We also replace the headliner, door panels and all seating surfaces and cushions with brand new period correct marine grade vinyl or premium leather upholstery. We then install new carpeting throughout, always matching original Toyota colors and specifications unless our clients instruct otherwise. Our expert upholstery craftsmen ensure that every aspect of your newly reborn Vintage Cruiser™ interior is completed using time-tested techniques and materials. The truth is in the details and this is why we pay very close attention to the brightwork of every Vintage Cruiser™ that we build. We meticulously remove, clean, zinc plate, re-chrome, re-galvanize and anodize each and every single trim piece, nut and bolt to ensure an original factory finish of all our Vintage 4x4™ restorations. We also replace all weather tripping, including window moldings, body seals, channel felts, and door seals with Toyota genuine parts whenever possible. There is no stone that is left unturned in our pursuit to redefine the Vintage 4x4™ experience. During this final step of production, we can finally see the results of the more than 1500 manhours that it takes our dedicated team of Land Cruiser experts to complete each Vintage 4x4™ restoration. This is where all the hard work pays off and where we meticulously pay close attention to every last detail. At this stage, we replace all emblems and insignia, the front and rear turn signal assemblies, and all doorsill plates and body hardware. We also make final adjustments to all body panels and re-adjust the cabin bolts (as necessary), to ensure a properly mounted cabin to the chassis. Every Vintage Cruiser™ we finish is as true and straight as when it came off the assembly line. Throughout the entire Vintage 4x4™ restoration process, we fully document the transformation of your newly reborn Vintage Cruiser™ and provide regular updates. When your Vintage Cruiser™ is completed, we arrange for a professional photo shoot to take a detailed inventory of high-resolution pictures and videos, so you can share with friends and family. Your newly reborn Vintage Cruiser™ is then tested and prepped in anticipation of delivery. During this final 150-point quality-control inspection and demanding off-road audit, we fine-tune the engine, transmission and suspension. We also listen for squeaks and rattles and adjust the wheel alignment as needed, and ensure all electrical components are functioning before final certification. Finally, we have the largest regional Toyota dealership in Central Florida perform an independent, full service and comprehensive diagnostic on your newly reborn Vintage Cruiser™ before delivery. 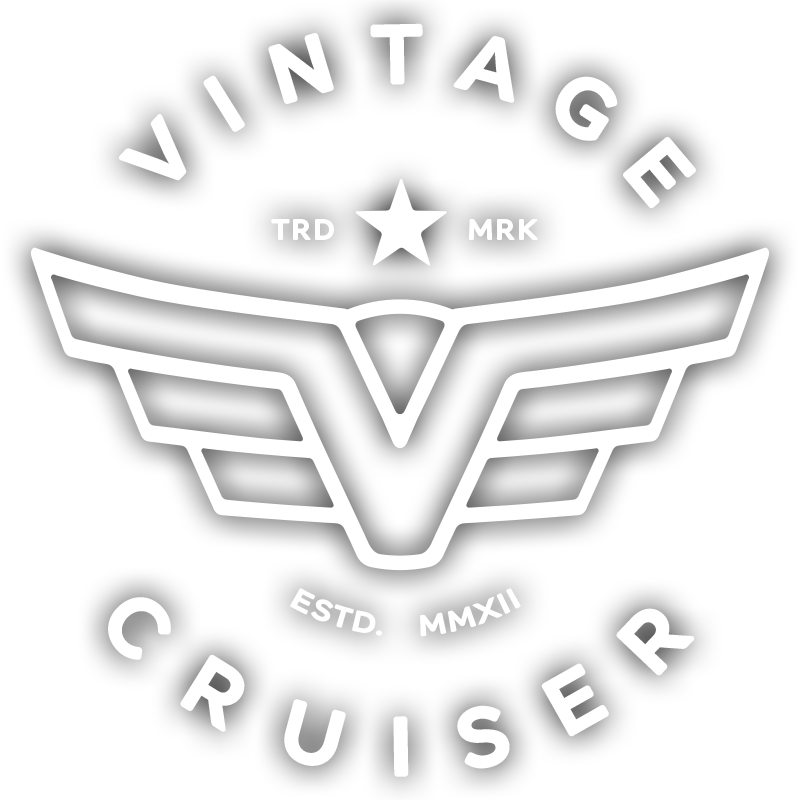 Once your Vintage Cruiser™ has passed final certification, we carefully load and secure it into a fully enclosed and dedicated container and ship it directly from Costa Rica to the Port of Miami where it clears customs and is fully titled. 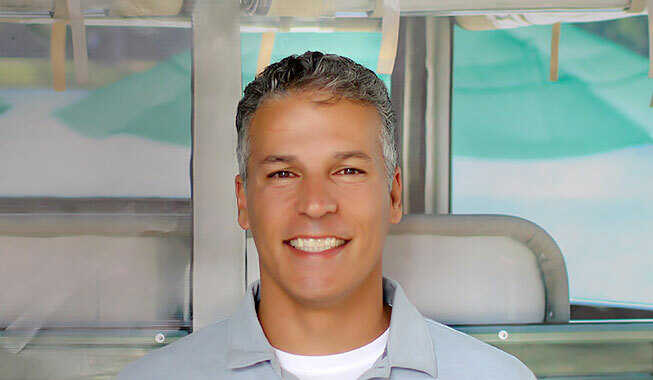 Our CEO then personally delivers your newly reborn Vintage Cruiser™ to your doorstep and provides a comprehensive orientation on every aspect of your new Vintage 4x4™so that you can get the most fun out of your on-road and off-road adventures. 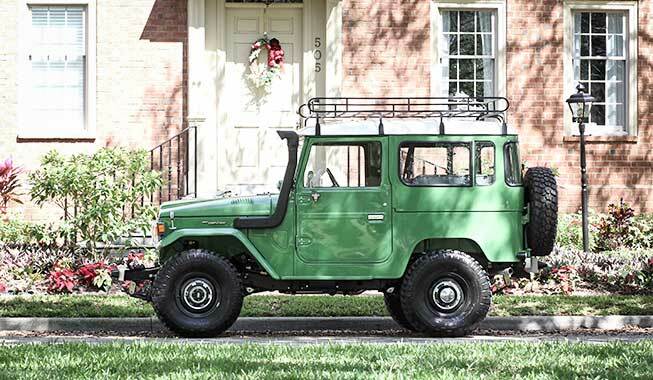 We love spreading the “FJ” Joy one Vintage Cruiser™ at a time.